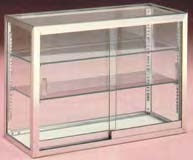 Tall Counter Display Cases - these 18" high cases are furnished with two glass shelves. Glass doors, on custom steel ball-bearing rollers, have recessed finger pulls. Finishes: Anodized aluminum frames are available in standard brushed clear finish.